On September 30th, 2018 Brandon, Reo and Ayaam tried out for the Mahwah Leadership Group. The tryout consisted of a physical test, a basic kicking test, a poomse test and a class score. The physical test required them to complete at least 21 proper pushups and 36 proper self-situps. The basic kicking test required them to demonstrate front snap kick, round house kick and back kick with proper execution. The poomse test required them to choose a poomse and perform it with proper technique, powerful energetic control and strong concentration. The class score is an overall score given based on their class behavior, effort and performance. All tryout participants passed the tryout and moved to the trial MLG period. The trial period allowed candidates to help out with class for 3 weeks while working on improving their chores at home and school. With their parents approval, and if the candidates showed enthusiasm and effort while helping with class then they would promote to become official MLG members after the 3 week period. 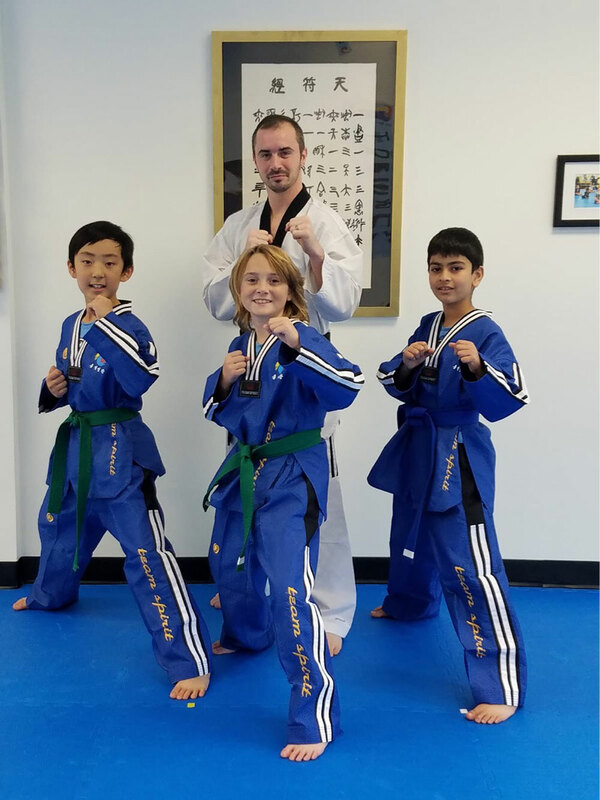 Hong Ik Martial Arts of Mahwah is proud to announce that Reo, Brandon and Ayaan have completed to process and have been accepted into the Mahwah Leadership program. What is next for Reo, Brandon and Ayaan? MLG Members come to study 2x a month together. MLG classes are designed to elevate members foundational martial arts skills while giving them a set of tools to use while helping with classes. They will also learn addiitional martial arts skills such as striking skills, nunchucks and demonstration techniques. MLG members are invited to participate in HST classes once a month in Tarrytown, NY where all Susa and Hyunsa’s come together to train and study under Grand Master Yoo. Hong Ik Martial Arts of Mahwah is excited to have MLG members participate in HST classes. MLG members are required to provide their service to their martial arts community. MLG members come to one designated class each week to help out with. Welcome aboard Brandon, Reo and Ayaan! We are excited for your future development!